Michigan State University apologized to dozens of women who say they were abused by disgraced former sports doctor Larry Nassar by name Friday. 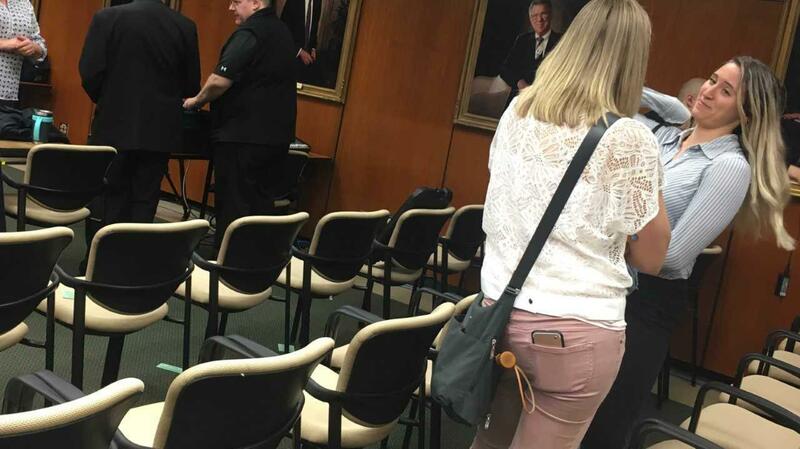 Megan Halicek traveled from Los Angeles to hear MSU acting President Satish Udpa say her name in a personal apology. Out of about 500 people who have come forward, about 40 opted to have their names read. The moment was important enough for one woman to make the trip from Los Angeles. Megan Halicek stood up when she heard her name. She says her healing journey that brought her to the MSU Board of Trustees meeting included months of struggle with overcoming PTSD and suicidal thoughts. She says she was ready to hear MSU make amends. Megan Halicek holds her mom's hand as names are read. MSU was criticized for not treating all sexual assault survivors, those related to Nassar, and otherwise, the same. Anna Pegler-Gordon is a faculty member with Reclaim MSU. “I would just say there are a large number of survivors on campus and the university is not treating anyone with the respect that they need," says Gordon. The university says it’s investing more resources into addressing sexual assaults from prevention to outreach, and is working on changing the culture. "Having a dedicated staff through the new Prevention, Outreach and Education Office (instead of just one person, which is what was previously there) will show results down the road in changing attitudes and approaches to sexual assaults on campus," says MSU Spokesperson Emily Guerrant via email. "In addition, MSU had added more mental health counselors, staff at the Sexual Assault Prevention unit, investigators to the Office of Institutional Equity, and is in the process of creating a SANE nursing program to assist students who have been assaulted." Also at the Trustees meeting, the Board approved at 1.95 percent room and board hike. MSU says it's the smallest increase since 1998. In addition, MSU will now also allow scooters on university bike lanes and roadways.